Dr. Jose Rodrigo Cayarga de la Hoz is a highly regarded practitioner and educator specializing in implant dentistry. 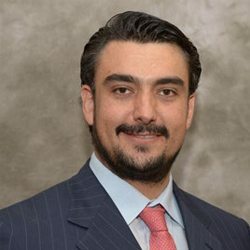 Currently in private practice at CAYARGA DENTAL, he also serves as Director and Clinical Instructor at the post-graduate Periodontics and Dental Implants Department of Universidad Francisco Marroquín (UFM) in Guatemala. Dr. Cayarga received his Degree in Dental Surgery from UFM (Facultad de Odontología) in 2009. He completed his advanced general training and clinical fellowships in Implant and Cosmetic Dentistry at the New York University (NYU) College of Dentistry, where he also served as a Clinical Instructor between 2010 and 2012. Dr. Cayarga’s research and academic interests include Osteotome-assisted sinus augmentation, Sinus Lift Surgery with immediate implant placement, Osseointegration and Guided Tissue Regeneration.